"At the ruins of Chichen Itza, the ancient Maya city in Mexico, crowds now gather on the spring (and fall) equinox to watch as the afternoon sun creates shadows that resemble a snake moving along the stairs of the 79-foot-tall Pyramid of Kukulkan, also called El Castillo. On the spring equinox, the snake descends the pyramid until it merges with a large, serpent head sculpture at the base of the structure. While the Maya were skilled astronomers, it’s unknown whether they specifically designed the pyramid to align with the equinox and create this visual effect." A dynasty of Persian kings known as the Achaemenians celebrated the spring equinox with the festival of No Ruz, which means "new day." It is a celebration of hope and renewal still observed today in many Persian countries, and has its roots in Zoroastrianism. In Iran, a festival called Chahar-Shanbeh Suri takes place right before No Ruz begins, and people purify their homes and leap over fires to welcome the 13-day celebration of No Ruz. Spring equinox is a time for fertility and sowing seeds, and so nature's fertility goes a little crazy. In medieval societies in Europe, the March hare was viewed as a major fertility symbol. This is a species of rabbit that is nocturnal most of the year, but in March when mating season begins, there are bunnies everywhere all day long. The female of the species is superfecund and can conceive a second litter while still pregnant with a first. As if that wasn't enough, the males tend to get frustrated when rebuffed by their mates, and bounce around erratically when discouraged. In ancient Rome, the followers of Cybele believed that their goddess had a consort who was born via a virgin birth. His name was Attis, and he died and was resurrected each year during the time of the vernal equinox on the Julian Calendar (between March 22 and March 25). According to the Venerable Bede, Eostre was the Saxon version of a Germanic goddess called Ostara. Her feast day was held on the full moon following the vernal equinox–almost the identical calculation as for the Christian Easter in the west. There is very little documented evidence to prove this, but one popular legend is that Eostre found a bird, wounded, on the ground late in winter. To save its life, she transformed it into a hare. But "the transformation was not a complete one. The bird took the appearance of a hare but retained the ability to lay eggs...the hare would decorate these eggs and leave them as gifts to Eostre." 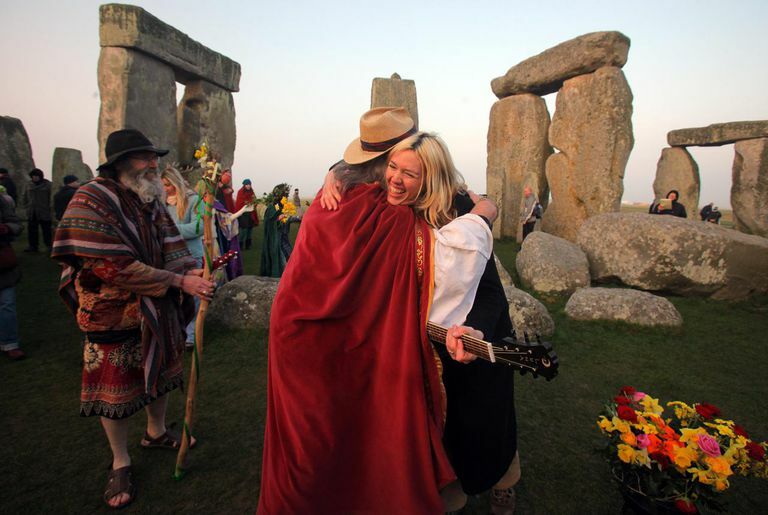 Many modern Pagans mark Ostara as a time of renewal and rebirth. Take some time to celebrate the new life that surrounds you in nature–walk in a park, lay in the grass, hike through a forest. As you do so, observe all the new things beginning around you–plants, flowers, insects, birds. Meditate upon the ever-moving Wheel of the Year, and celebrate the change of seasons.